Today I bought me some eyebrows. Oh yes I did. And this wasn't a treat - it was a necessity. This was long overdue. I have left mine for months, fearing and detesting the thought of splaying out in the middle of Debenhams/House of Fraser/Superdrug again and having someone make me cry with threading. So I put it off....and off....this weekend I needed an intervention. So I went for the creme de la creme of brow treatments - the HD Brow. Now I admit the name of this treatment borders on ridiculous and it cost about £40 - but my initial impressions are that it was totally worth it. It's the most intensive eyebrow regime I have ever had and leaves you with a sharp and defined look. I think I actually gasped when I looked in the mirror at the end - it's one of those fun transformations that sort of shocks you. I love that. It took my rounded, overgrown, colour-patchy and messy brows and made them angular, thick and consistent in colour - ultimately a more groomed look. NOTE: These photos are a bit washed out as they were taken in Photobooth....but you get the idea! I have embedded the video below which shows you how the treatment works...it's 7 steps of removal and styling. Think tinting, waxing, threading, plucking, trimming and pencilling in. I have to say that I am not sure if this is for everyone. The style of the HD Brow seems to quite bold. I personally love strong brows - probably because I could never seem to grow my own - because to me they look rich and well groomed. My brow icon would be Camilla Belle for this reason. If you don't like that look - or if you have it naturally - then don't waste your money. 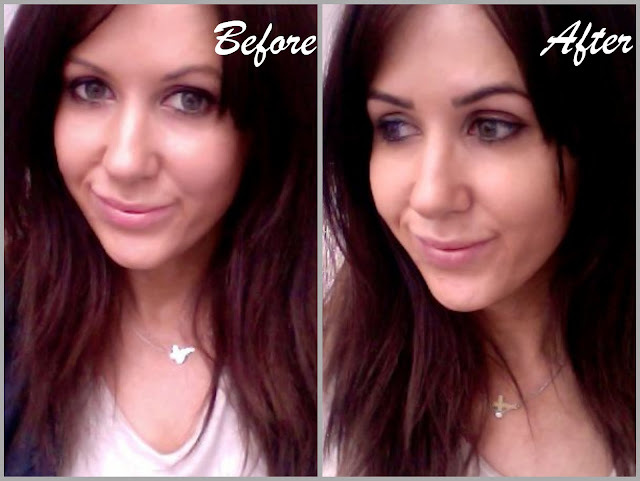 More about HD Brows here - Link! Where I got them done - Link! That looks awesome! I'm well jel Laura. I'm constantly messing with my brows and they are in a right state. Thought about getting them done in Harvey Nicks but after seeing this, I might reconsider as long as I'm still in the UK. Might as well return to Munich with statement brows! @Tine_77 - ah you have to! :) The Harvey Nicks place looks good too though - am sure they do amazing treatments and it's a little bit more tucked away that some of the usual department stores. Let me know how you get on! This sounds interesting and your eyebrows look great. I do like the results of threading but having it done in the middle of Debenhams isn't the nicest experience so I might look into this although £40 is a lot. wow, your eyebrows really have transformed. i might have to see where this is available in central london. I am also a brow fiend. Best brow wax experience I ever had was in thailand. She did an amazing job. Ive always wanted to experience threading.Just not sure if im tough enough! @Nana - i am sure there are loads of places :) let me know if you try it! @Dannii - ooh no. I have had disasters where they have completely overplucked...gutting! wooo they look fantastic! ive been trying to grow back my brows as they were made too thin last time and now i dont know where to go. id normally be going to Glow but this looks so good.... 40quid on the other hand... and how often do you need to come back there? Laura, Is this done only in UK or outside the UL as well. I am asian and those sharp eyebrows like Camilla belle suits me. I always fill my eyebrows to make it defined eyebrows like Camila belle and people always say I look much better when my eyebrows are like that. I am asian and I have fine hair on my eye brows. Som do you recommend doing this on fine hair as well? This is going to be my next treat to myself. Oh yes!! I'd suggest you to go and get your eyebrows permanently dyed and waxed/plucked at a beauty therapist's. I do and I get the same result under 5€ per visit. Much cheper and looks amaze! @Nina - yay! let me know how you find it! These are what I call brows!!!. I am making a booking as i am typing this. Thanks for sharing. Your brows look great! I've never heard about HD brows until your post. I love the bold look it really looks great. I would have done the same thing. I think our brow really completes your look. oh wow i love it! i never heard of this before, the brows are so important and i don't feel "done" unless they look good. I'm so nervous of anyone but me even touching my eyebrows after one terrible experience with a mua and her pluck-happy hands. I love how defined your's look though, they've done a great job. Need to get over this fear! I just can't decide if I would like these on me or not, even though I love bold eyebrows. However yours are the best i've seen so far, still bold but not OTT! That looks amazing! I'll have to try that. I got mine threaded a few months back and it hurt me so much I think I'll be sticking to ungroomed brows for a while! ha ha ha! Yours look great. i've had my brows HD'd for nearly a year now, costing me £25 so a bit cheaper than the price you quoted! love them! I love getting mine threaded as they get every last hair and even seem to be able to clip them in the process so they never look bushy. I do have a high pain thresh hold though I must say. I've always wanted thin brows! But I'm too nervous to change them (or let anyone else take a whack at them). The darker brows look gorgeous on you though. i know what you mean about threading, i wanna go after the people who told me it wasn't painful lol! The part that most interested me was actually the trimming. This is probably too much information, but I inherited my grandfather's abnormally long brow hairs. And they're infuriating. I do what I can to avoid looking like a cavewoman, but I lust after short brow hairs in a way that makes me slightly uncomfortable. Being Serbian, if I don't take care of my brows every few days, they grow together into a unibrow! Laura would this work on someone who barely has eyebrows? I over plucked when i was younger and they haven't really grown back fully and I always have to draw them on every morning. I've never even heard of this before! Looks great, I'm a fan of a thick brow. Hate the girls that draw on a single line and call it a day. Ahh the brow experience! Looks absolutely amazing on you, but its such a trauma! I have really sensitive eyes that water at EVERYTHING. So when I get mine waxed, when I do it myself at home...I cry a river. But no matter how many times I say "Dont worry if they water, theyre just sensitive" I get the waxer saying "Are you ok? Does it hurt too much?" and I'm just there protesting "No, no, I'm strong! It hurts me not! I just have silly eyes! "...but they do not believe me, and just shake their head. Sigh. I can't believe you find threading painful! I will say though, places like Debenhams or Fenwicks are actually quite painful. I find small businesses, especially by indian/asian women are the best for threading. It's just slight stinging for me there! wow, this looks amazing. i am now following your blog. Why oh why can't this be available in the United States??? Oh my goodness this is so weird, but I love it on you! check out my little blog? Thank you so much for the blog post...very very useful, I'll absolutely try this :). nice blog Thanks for sharing. was really very nice.Sesli Sohbet Seslisohbet thank you. Well-shaped brows are crucial to a complete look. I had super thin eyebrows and a friend told me about Neubrow, something that would thicken my brows, especially those thinner areas. I tried it and LOVE it. You can read up on it at www.skinresearchlabs.com. No more filling in with a pencil! Specialist team of Beauty Express are committed to providing you HD brows, European Facial, Express Facial, eyelash extensions, Waxing for men and women, full body massage, Waxing and hair removal, Botox treatment, Semi permanent makeup or lashes with the very best salon experience.